The twin Gravity Recovery and Climate Experiment (GRACE) satellites, launched on March 17, 2002, have been making detailed measurements of Earth’s gravity field from space and revolutionizing investigations about Earth's ocean, water reservoirs, large-scale solid Earth changes, and ice cover. 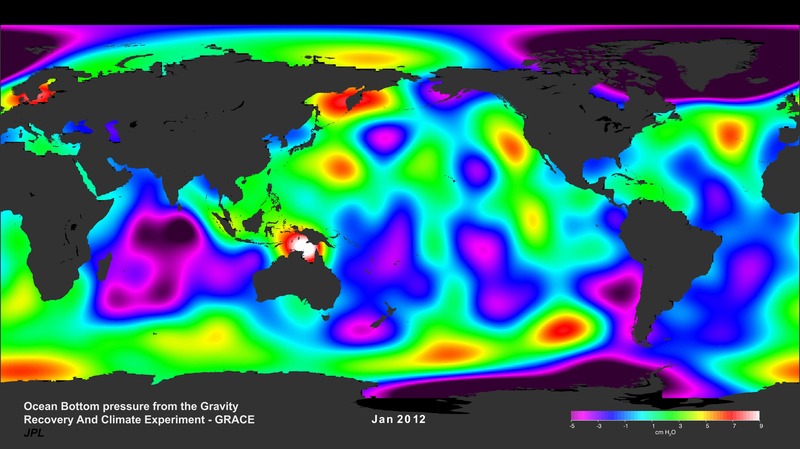 To aid in the interpretation of gravity change over the oceans, the GRACE Tellus project provides ocean bottom pressure maps derived from the GRACE satellite data. Ocean bottom pressure is the sum of the mass of the atmosphere and ocean in a "cylinder" above the seafloor. This visualization shows monthly changes in ocean bottom pressure data obtained by the GRACE satellites from November 2002 to January 2012. Purple and blue shades indicate regions with relatively low ocean bottom pressure, while red and white shades indicate regions with relatively high ocean bottom pressure. Scientists use these data to observe and monitor changes in deep ocean currents, which transport water and energy around the globe. Monthly changes in ocean bottom pressure observed by the GRACE satellites.